There are many options in treating rosacea. So many times we believe the cure is as simple as the prescription we pick up at the pharmacy. But is this always the best and most educated choice? The questions you need to ask yourself at this stage of rosacea treatment is; what are the side effects of each medication, how safe is this medication and how effective will it be in addressing MY symptoms of rosacea. It’s amazing how many times the treatment for rosacea lists among its side effects, itching, rashes and redness of the skin – Aren’t these the very symptoms we are trying to treat? Severe rosacea or stage three rosacea, is a persistent inflammatory condition in which the facial redness last for two or three months, the flushing areas may appear swollen, reddish bumps (without pus) called papules and pustules of an acne form (with pus) begin to appear and may remain present and become painful. In some instances, the sebaceous or oil producing glands on the nose and possibly the cheeks become enlarged resulting in a buildup of excess tissue on or around the nose area. This complication known as rhinophyma may develop very slowly over a period of time resulting in the nose becoming red, enlarged and bulbous. So many times we believe the cure is as simple as the prescription we pick up at the pharmacy. But is this always the best and most educated choice? The questions you need to ask yourself at this stage of rosacea treatment is; what are the side effects of each medication, how safe is this medication and how effective will it be in addressing MY symptoms of rosacea. It’s amazing how many times the treatment for rosacea lists among its side effects, itching, rashes and redness of the skin – Aren’t these the very symptoms we are trying to treat? So with all the avenues of treatment available, how do you choose the right one? Often the best approach to rosacea treatment is education. Take the time to learn what rosacea is and explore the theories as to the cause. This will enable you to take a pro-active, positive approach to YOUR rosacea treatment. When you control your rosacea treatment, you control your results. So what exactly is rosacea? Rosacea is an inflammatory response triggered by our immune system to address what the skin and body interpret as an attack on the body. The skin acts as an outer shield to protect the internal organs of the body and the redness and inflammation as triggered responses to act as a re-enforcement to what it sees as a weakened zone in the body’s defense system. The skin redness is a rush of blood flooding to the area to support the skin’s defense and the inflammation is a buildup or thickening of the skin to add extra protection to the weakened area. For whatever reason, sometimes our body’s immune response goes into an overdrive response and the indicators that would signal the skin to stop the defensive response fail to do so. This leads to a sustained flushed or reddened appearance of the skin. The body’s defense system response becomes imbalanced and in effect turns and attacks itself. To control the response of the skin that causes the symptoms of rosacea, we must first realize the need to correct the imbalances that exist within our body to create an optimum environment for the skin to heal and repair itself. The first step is to determine the current pH of your body. The body can be too acidic as is most often the case or too alkaline, in either case the body will not be able to perform at its best. The proper pH of the body should be in the range of 7.35 to 7.42, this can vary slightly from person to person but the goal is to be within this range. Once the body is performing at an optimum level, we will have successfully begun to address the symptoms of rosacea. To further the process of healing, examine the ingredients of what you have been applying to your skin, these ingredients often offer a clue into what may have triggered the inflammatory response that initiated your current rosacea flare. If we over-exfoliate the skin, we trigger that inflammatory response rushing to protect the weakened skin and in doing so create more severe symptoms of rosacea. 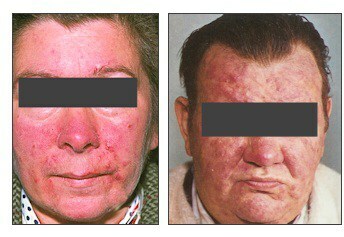 Another standard of past rosacea treatments has been the use of oral or topical antibiotics. The theory being that the antibiotic will temporarily reduce the inflammatory response allowing the skin a chance to begin the healing process. Extended use of antibiotics has produced a whole new set of issues with antibiotic resistance and a reduction in the body’s pH causing the skin to over-defend itself as described above. The Solution then must be a pathway to better skin care choices and finding new ways to boost the body’s defenses. An excellent guide to better skin care choices can be found in a review of lifestyle recommendations for improving rosacea.